If the temperature is still cold in your area but you are ready for Spring, why not spend the weekend indoors working on a DIY home project? 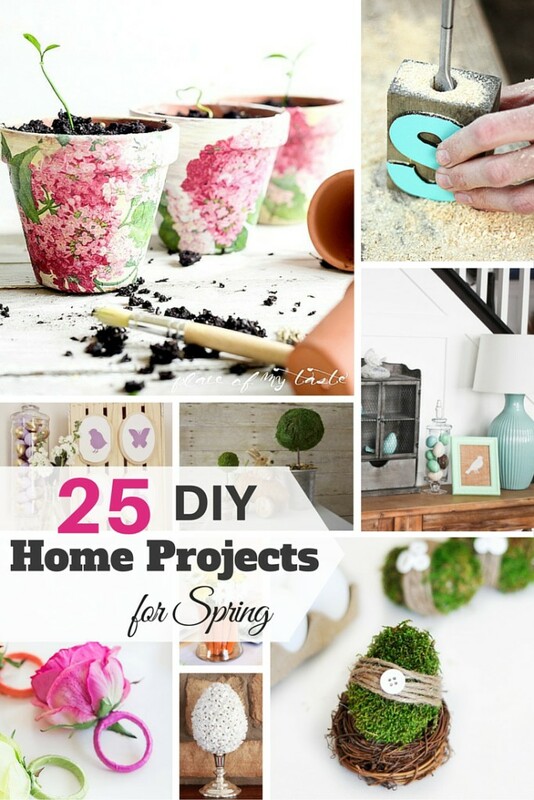 I’ve found 25 DIY Home Projects for Spring I want to share with you to help spark ideas. Several of these will make great Mother’s Day gifts too! These are not my projects but of other bloggers I respect and you can find the list with links back to their blogs below. 3. This Yarn Egg Garland by ModpodgeRocksBlog.com will look beautiful over a mantle or Easter table. 6. Only have seconds to make your DIY? Then these DIY Moss Topiaries by 2beesinapod.com are right up your alley. 7. I think these Decoupaged Terra Cotta Pots by PlaceofMyTaste.com will be the perfect DIY gift for Mother’s Day. 8. Dandelion Paper Lanterns have been spotted in magazines and APieceofRainbow.com is teaching you how to make them. 11. This Mossy Spring Sign by CraftCuts.com will look pretty on any shelf in your home. 13. This Blooming Monogram by AllParenting.com as been all over Pinterest. 14. I love, love love this Succulent Birdhouse by JoyUsGarden.com. I can just picture hanging this in my yard or in a wreath design. 15. Another Pinterest favorite of mine, Moss-Covered Easter Eggs by LoveGrowsWild.com. 20. With all the silk flowers I have laying around, this Blooming Easter Eggs by ThatsWhatCheSaid.net looked intriguing! 21. This Spring DIY Printer Tray by ConsumerCrafts.com will look cute in my office or daughters room. 22. Look at this festive Carrot Centerpiece by LoveGrowsWild.com for your Easter table. 25. Love the simplicity of this Rose Napking Rings by TheChicSite.com. It will look great for a spring tablescape. Let me know what you think of these 25 DIY Home Projects for Spring. Do you like to make projects with your kids or do you use your craft time to unwind and detox from the week?